After a whirlwind tour of County Kerry we headed up to the town of Doolin in County Clare. This was a small town right on the coast. 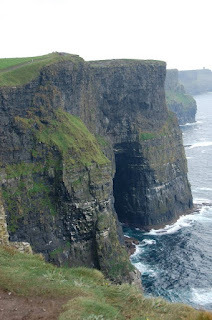 From there we made trips to the Cliffs of Moher and the Burren. Driving through the countryside you run across really neat church ruins and cemeteries all over. There were tons of walls separating who knows what, but they were awesome. Look at that! Someone had to carry all those stones. Poulnabrone Portal Tomb - this was an awesome "stonehenge"-looking tomb in the middle of the Burren (explained below). Ireland is loaded with prehistoric rock formations that were used for ceremonies, burials and who knows what else. The Burren and one of Marisa's best National Geographic shots. This was a science teacher's dream. Lisdoon is a wee little town that is world famous (apparently) for hooking people up! It was even the setting for a film a few years back - I think it was called "The Matchmaker", how original. I shouldn't even put words here and let the scene speak for itself. 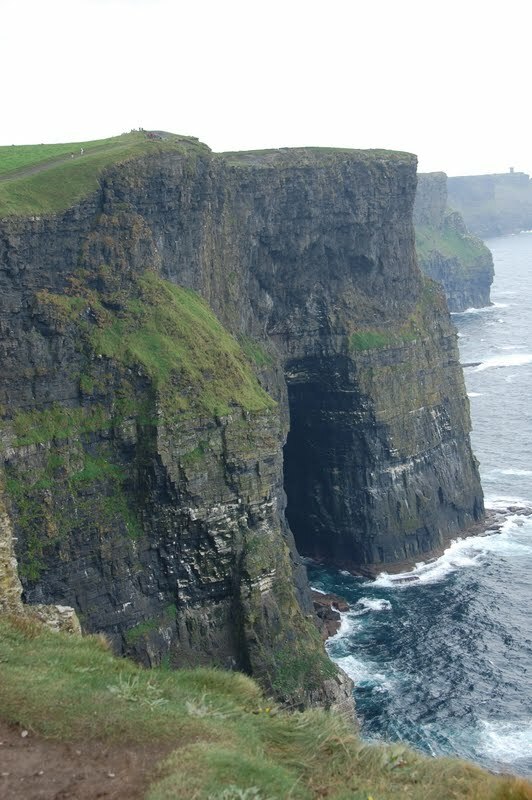 The Cliffs of Moher is without a doubt the biggest highlight of County Clare. These sheer cliffs host families of puffins and have been known to claim dozens of lives even recently (both accidental and intentional). The winds are unbelievably strong coming up over the cliffs and they try to keep people a safe distance away from the edges. However, signs and easily scalable walls don't keep everyone out of harm's way. This is as close as I felt comfortable. Cliffs of Moher, pronounced "More"
We celebrated Susan and Terry's 10th wedding anniversary with a nice dinner at our B&B's restaurant. The years have been kind! No trip to Ireland is complete without spending some time at a local pub to listen to traditional music. The town of Doolin supposedly has some of the country's best. This was our last stop on our Ireland adventure. It was so good to see my mom and take a trip that we will talk about the rest of our lives. My mom had not been back to Europe since her college graduation trip with her friend, Mary, 37 years ago. I am so glad her and Terry crossed the big blue and got to experience the wonderful culture and people of Ireland.